A new national study from the Institute of Truth in Accounting highlights how state leaders, including those of North Carolina, have dodged balanced budget requirements—and to such a degree that it has become the convention. Prevailing methods of state accounting do not reveal accurate debt levels, and they have concealed a total of $1 trillion of outstanding bills, including $30 billion in North Carolina. The Institute’s “Financial State of States” report took a deep look at each states’ Comprehensive Annual Financial Report (CAFR) to compare assets with liabilities. For the first time, a detailed analysis of pension and health care liabilities has exposed all fifty states’ actual obligations. From these calculations, the Institute was able to determine the true individual taxpayer’s debt burden. 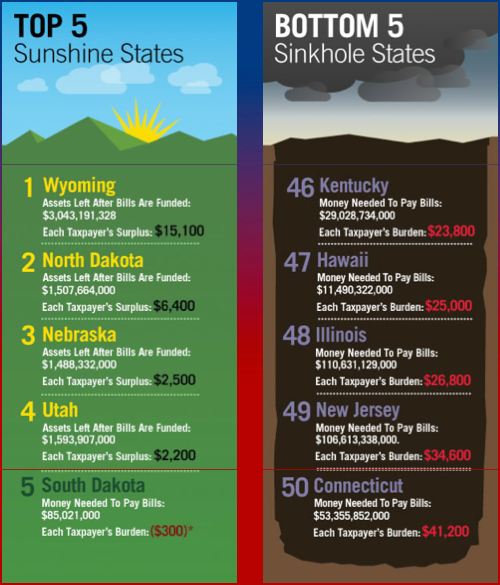 By ranking the states, the Institute identified the top five ‘sinkhole’ states sinking in debt, as well as top five ‘sunshine’ states with taxpayers’ surplus or minimal per taxpayer’s burden. North Carolina is ranked 30th in the nation, with per taxpayer’s burden of $11,200. The primary reason why states’ budget statements have failed to reveal their true deficit, as the study explains, is the use of antiquated and faulty budgeting and accounting principles. Put simply, the shortcomings of these principles overstate revenues and understate expenses. By accepting these approaches, legislators have systematically ignored accruing costs when formulating budgets, and the effective result was that elected officials hid important information from their citizens and themselves. Pensions and other post-employment benefits of states’ employees account for the largest amount of concealed debt burden. Unfunded pension benefits and retirees’ health care benefits in North Carolina, for example, were made up 55 percent of the total liability. The trick state officials use is to push current compensations onto future taxpayers. Pension and other post employment benefits (OPEB) are earned each day an employee works, so correct accounting dictates that the cost of these benefits accumulates every day. A lack of money set aside generates a liability to be paid when these employees retire.